California is home to statewide network of marine protected areas (MPAs), established to protect the integrity of marine ecosystems, rebuild depleted marine life populations, including those of economic value, and improve ocean health. 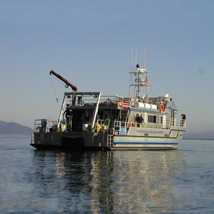 Through a novel public-private partnership, California has entrusted to the Ocean Science Trust the task of leading a collaborative effort to build and maintain an MPA monitoring program that can serve the State with rigorous science into the future. Innovation in MPA monitoring is not an oxymoron. But, in practice, overcoming the classic perception of monitoring as scientifically mundane and a financial burden is challenging. How can research be responsive to management when funding and academic advancement don’t encourage it? How can managers make use of academic science when research programs don’t align with management triggers? With the State, we are piloting a globally unique model for a sustainable monitoring program that serves California broadly. Partnerships are key. Beginning with the Central Coast region we have surveyed existing capacity and expertise, and are building a new program that uses state support to strategically knit together, seed and leverage ongoing efforts. Our vision is a program that grows in relevance and value in supporting policy and management across jurisdictions and mandates. Working in partnership with the Department of FIsh and Wildlife and in collaboration with scientists, stakeholders and other managers, we developed a new framework to guide and organize monitoring so that it meets the most salient science needs of the state. Regional monitoring plans are adopted as state policy by the Fish and Game Commission, and lay the foundation of a statewide approach to rigorous decision-support. MPA monitoring under this framework addresses broad questions about condition and trends of ecosystems, as well as specific questions about the impacts of MPAs in a region.